The sterling silver that surrounds it is worked by master craftsmen in the Nepalese mountains. I've added a strand of lapis beads that range in size from 4 to 8mm (not equal in quality to the focal pieces, but still extremely fine), and 6mm turquoise beads. The sterling silver 'S' hook and accent beads are Indonesian. The larger beads are spaced with sparkling silvery glass seed beads to make an 18 inch strand. It's a unique and absolutely beautiful necklace from SPARKLE PLENTY. 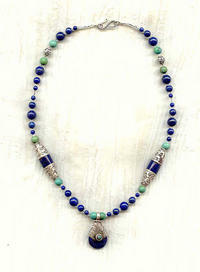 Miss Lorna Condon made the pendant and the matching beads in the strand, all in shades of turquoise, ivory and khaki.